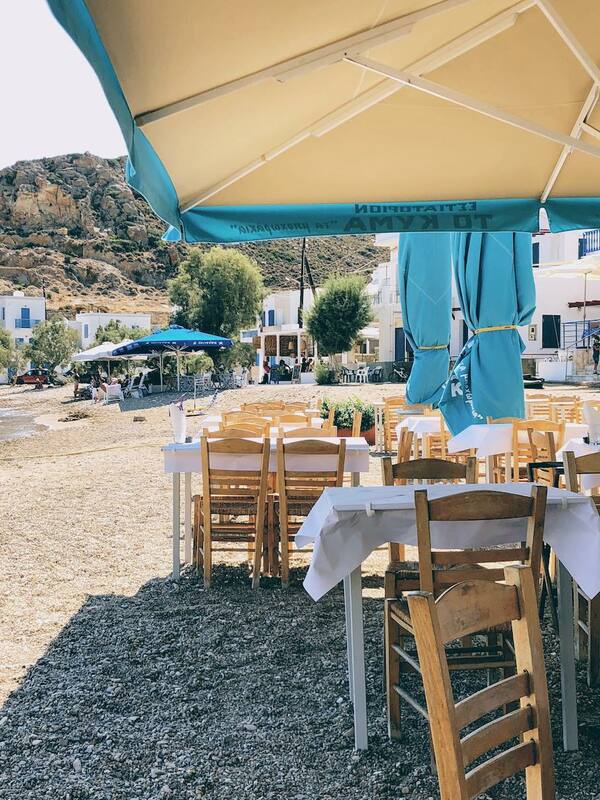 The taverna has been operating for the past 25 years or so (under the nickname "ta bohorakia") but has recently started taking everything up a notch as more and more avid travelers discover this gem. Although the dishes have become quite a bit more sophisticated, there's still a traditional taste to everything they do. The classic wooden chairs and tables are set right on the beach of Psathi in plain white papercloth and the beautiful veranda on their front porch is decorated in striking turquoise color. An army of waiters, helpers and cooks are waiting to serve you, and even during the night when the place gets very busy everything runs like clockwork! Highlights? For sure the best ladenia around, the traditional tomato pizza-like bread of Kimolos. The more you eat, the more you want! For starters, you'll definitely need to try their marinated anchovies and some of their fresh seafood carpaccio or tartare - we tried lobster carpaccio with lime and rock salt which was mesmerizing! Finally, their sea urchin salad is really taste with a bold flavour from the thick olive oil - must try! If you wanna go strictly for mains then you better get your hands on some lobster pasta. If not, then you can easily share delicious and more generous starters like the steamed mussels and their signature octopus dish with balsamic vinegar. Finally, you can also enjoy some more creative dishes like the shrimp trachanoto with tomato sauce and scorpion fish giouvetsi - delicious!